In one word – AWESOME! With all the snow waiting to melt in the mountains above our rivers, we are expecting a super great river rafting season on all of our rivers. This spring we will see higher flows on our South Fork American river rafting trips that we have not seen for a number of years. Higher river levels mean that our normal South Fork trips will be at a more intermediate level. Bigger waves and much faster current will be encountered. If you think you have done the South Fork and it’s a mellow river, please think again. I have been guiding for over 40 years, and when the South Fork American is high, it is super fun and exciting, definitely not a mellow ride. 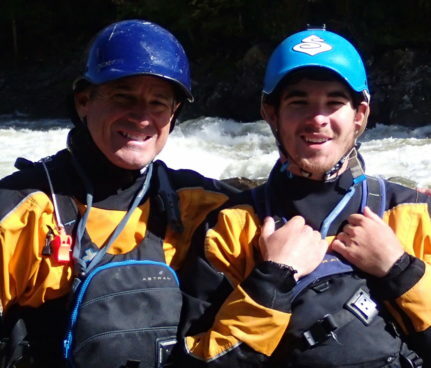 Wet suits are required for all spring South Fork American river rafting trips (we include them free). The downside of having high water, is that our family river rafting trips with younger kids will be put on hold. When the water comes back down toward normal, usually about the 3rd week of June, they will begin again. During times of high water, all participants need to have swimming ability, be in good physical condition, and be on the adventurous side. Age limit 13 in times of high water. 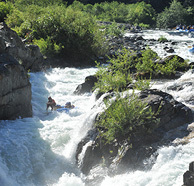 The free flowing (un-damned) North Fork American river will have great water flow all the way through mid to late June. We do not usually get a long season on our North Fork trips due to its wild and natural nature. If you have not been on this great river, try to plan your trip fairly soon. Dates are very limited (especially on weekends). We offer half day and full day trips on the North Fork. If you want the ultimate one day trip, ask about our Double Run. You will be rafting the 9.5 mile section 2x in one day. As with all class 4 river rafting adventures, wet suits (provided by us) and good swimming ability are required . Also all participants need to be on the adventurous side and over 13 years of age. What can I say about the Merced? Well, The Merced is an awesome one day river rafting trip when we have great water, as we do this year! This is most likely the best one day trip as far as big, exciting, and fast whitewater. We cover a total of about 16 miles. Giant wave trains and big crashing holes that come in quick succession are the norm for the Merced in the Spring and early Summer. We are expecting the Merced to last into July and maybe longer. 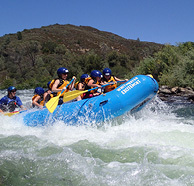 Only 30 minutes from the entrance of Yosemite National Park, river rafting on the Merced river is a great weekend event. Whitewater rafting one day and hiking or viewing the super flowing waterfalls of Yosemite the next is a great plan. You can’t get any better than this. Wet suits will be required and provided by us at Whitewater Excitement ( 6’4″ and 250 pound limits however). 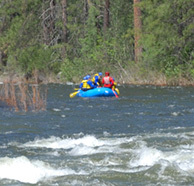 Well, the Middle Fork American rafting is best when the water levels are near normal. We won’t be rafting this awesome summer rafting trip until late June (but please call to check as this could change due to weather conditions and the snowmelt). If you like rafting experiences without wet suits, and with hot weather and exciting class 4 whitewater, give the Middle Fork a try later in the summer, when the snowmelt has finished. Our 2 day trips that combine 2 rivers in 2 days have become very popular. We have designed our private campground, vehicles, and guides to make the most out of these multi-day adventures. Early this spring check out a South – North 2 Day river rafting combo, which involves rafting the South Fork with big water the first day and then head over to the challenging Class 4-4+ North Fork American. We provide it all; wet suits, camping 2 nights at our own riverside private camp, and 5 meals prepared by our own Camp Chef! A very exciting weekend (or weekday for those who can or have some time during the week). Again all participants need to have good swimming abilities, be in good physical condition, and on the adventurous side to raft any of our class 4 trips. All in all, 2019 will be a great year to raft. For those experienced or adventurous looking for maximum thrills, try making your river rafting plans for April to mid-June. Give us a call if you have any questions or would like to know what would be the best experience for you. We will be happy to help in any way possible.